My relatives came from Israel where they served to guard and herd cattle and sheep. My senses of smell and hearing are so sensitive that I am able to detect intruders from a considerable distance. I am intelligent and respond well to training, so I make a loyal family pet and watchdog if I am raised from a puppy around children and other pets. My medium length coat is straight and sleek, requiring minimal grooming and it comes in either white with black or brown markings or brown or black with white trim. When fully grown, I am between 35 and 55 inches tall (88.9 to 139.7 centimeters). We have no Canaan Dog Breeders listed at this time. 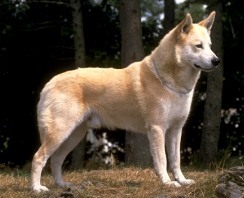 Click here to place your Canaan Dog Ad!